Want to know which 8 Fall garden tasks you should be doing this fall? Ready to accept our Fall Bootcamp Challenge? These 8 Fall garden tasks should be a part of your regular garden maintenance tasks anyway, but especially during the Fall. Listen to our quick segment on this "DIY Garden Minute" to learn about what mulch is, how and why we use it, and if you should Divide Or Not to Divide your plants this Fall. This episode is the beginning of our 7-episode podcast mini-series on 8-Fall Garden tasks you should be doing, so stay tuned and come back to see the next episodes on the garden tasks. Save "8 Fall Garden Tasks You Should Start Right Now!" to Pinterest for later! 8 Fall Garden Tasks and Our Fall Bootcamp Challenge! 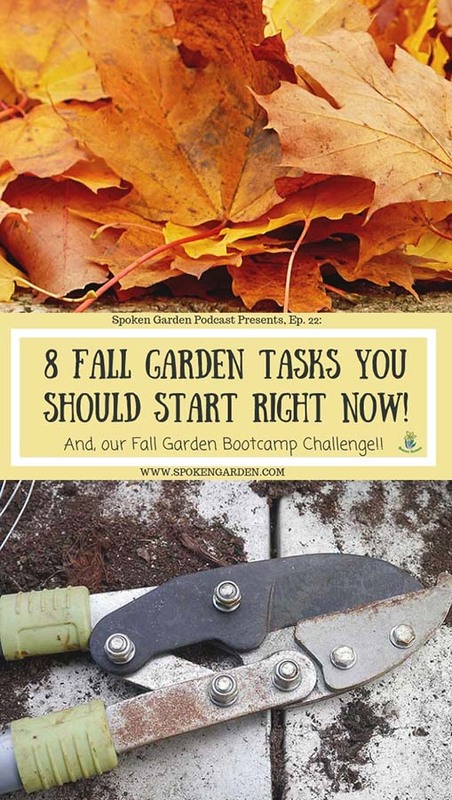 Learn which 8 Fall garden tasks you should be doing right now in your garden and choose to accept our Fall Bootcamp Challenge to get your garden ready for this fall and winter! 8 Fall garden tasks you should be doing. A layout of the next 7 podcasts in this series. What our Fall Garden Bootcamp Challenge is and how you can join! The pros and cons of English Ivy.